"The Great Recession was very different when compared with business cycle recessions," writes Don Macke, entrepreneurial communities director for the Center for Rural Entrepreneurship. "It reflected fundamental changes and illustrated in no uncertain terms that America had lost its advantage and must work harder now to ensure competitive edge and renewed prosperity." As we slowly recover from the recession, the center is reminding rural people and their leaders that "Economic development is a uniquely local responsibility in America when compared to nearly every other nation on the globe," as Mackie notes. "This reality is even more important today as our federal and state governments struggle to function and show less and less capacity for leading our nation’s development." Smart Game Plan: "What has worked in the past may no longer make sense." Robust Investment: This includes reinvestment in public facilities and infrastructure. Entrepreneurial Development: Grow your own entrepreneurs to create local jobs. Sustained Effort: "The key . . . is renewal of community leadership." Growth Entrepreneurs: They "are present everywhere and they can be nurtured." Attributes of an Entrepreneurial Community: A Georgia program has identified them. Immigrants and New Residents: If you embrace them, your community does better. Real Regional Collaboration: Many communities are too small to go it alone. Civic and Social Entrepreneurs: Not all effective entrepreneurs come from business. For a PDF of Macke's "Growing Entrepreneurial Communities," click here. 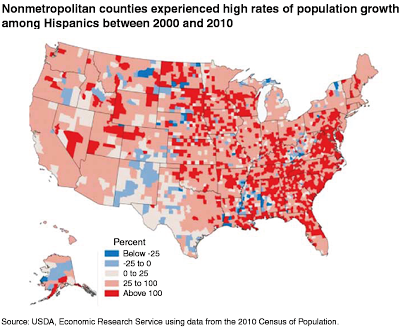 The study says the trend of depopulation from young people moving out of rural areas and into metropolitan ones "slowed and in some cases reversed in some non-metropolitan areas, largely as the result of growth in the Hispanic population into these rural areas," starting in the 1990s. Significantly, a boost in population from Hispanic immigration is often self-sustaining, as immigrant families have children and bring the age demographics of an area down. "Small communities experiencing declining population and tax base as a consequence of the substantial out-migration of their working-age natives were revitalized or prevented from losing their local plants by the arrival of hardworking immigrants who were willing to accept practically any kind of job, including the cold, wet, repetitive, and injury-prone jobs in meat-processing plants where the low wages were nonetheless higher than farm wages and several times the wages in the immigrants' home countries," the study said. Gun-related violence has dominated many of the last year's headlines and much of the socio-political debate. In light of this fact, PBS NewsHour will be broadcasting a week-long series on the topic next week. The special programming is called "After Newtown," named after the tragic December 2012 shooting at Sandy Hook Elementary in Newtown, Conn. The coverage will include contributions from several PBS program staffs. Although the series' subtitle is "Guns in America," the PBS website says the related topics of mental illness and school security will also be discussed. Some other subjects on the schedule are the movie theater shooting in Aurora, Colo., violent video games, the science of violence and the brain, arguments for and against concealed weapons, gun violence as a public health issue and more. A complete schedule is available here. "The equipment used to make maple syrup looks like the equipment people use to manufacture meth," and that led a Southern Illinois police tipster to the wrong conclusion, reports Jason Hibbs of WPSD-TV in Paducah, Ky. Maple trees can be tapped for syrup anywhere, not just in Northern states, but the practice is less common the farther south you go, and the anonymous tipster who saw the equipment in Union County, Illinois, and called the cops. They saw it was just a maple tap, set by the family of Laura Benson for their own use. UPDATE, Feb. 19: Gov. Steve Beshear says law enforcement concerns should be resolved before such a bill is passed, reports Lori Hailey of The Lane Report, a Kentucky business magazine. The Lexington Herald-Leader says Speaker Greg Stumbo's opposition looks political. A bill to allow and regulate commercial hemp crops in Kentucky if the federal government allows it passed the Republican-controlled state Senate 31-6 today, and the state's senior U.S. senator, Minority Leader Mitch McConnell, joined fellow Republican Sen. Rand Paul in co-sponsoring a bill to "distinguish hemp from marijuana in the eyes of law enforcement," Janet Patton reports for the Lexington Herald-Leader. UPDATE, Feb. 17: Patton and Salon examine hemp's potential. 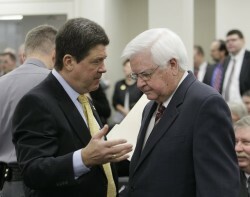 The state bill faces a big obstacle in House Speaker Greg Stumbo, who is a Democrat but is also a Eastern Kentucky ally of Republican U.S. Rep. Hal Rogers, who founded a regional anti-drug agency that could lose funding if the federal government gets less aggressive about marijuana and/or if hemp farming drives marijuana growers indoors. Agriculture Commissioner James Comer, a Republican, told Patton he has the votes to get the bill out of the House Agriculture Committee and through the full House, but Democratic Gov. Steve Beshear was skeptical of the measure today, in his most lengthy public discussion of the subject to date. He said another crop "might be good" for farmers but "We really don't know anything about whether there's going to be a market for it yet. . . . So we may be yelling about a lot of things very loudly that really don't mean too much right now." 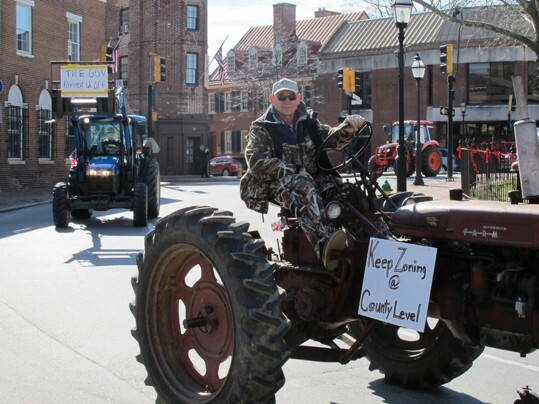 Protesters rode tractors past the Maryland Capitol building in Annapolis this week in protest of the state's new restrictions on septic tanks in rural areas. The "tractorcade" was in support of a bill being that would repeal last year's Sustainable Growth and Agricultural Preservation Act, Senate Bill 236. One sign read "Septic bill 236 belongs in a manure spreader," Tim Wheeler of the Baltimore Sun reported, noting that the protest was the latest epidsode in a debate that has lasted for months and included Republican allegations that Gov. Martin O'Malley is waging a "war on rural Maryland." President Obama's remarks on green energy during his State of the Union address this week left out a crucial component, rural communities, Jim Kleinschmit writes for the Daily Yonder. Lawmakers will have to do a better job of appealing to rural residents if they want green energy initiatives to take hold, wrote Kleinschmit, director of the Rural Communities Program at the Institute for Agriculture and Trade Policy. "Due to the structure of our legislative system, representatives from rural America -- and their constituents -- have played a disproportionate role in derailing federal climate action of the last several years," Kleinschmit said. "Rural resistance is due, in large part, to the complete neglect of this constituency by U.S. climate policymakers and activists, which allowed climate issues in rural America to be defined primarily by the fossil-fuel industry and its surrogates." Kleinschmit notes that rising costs from changes in energy policy will affect the prices of fossil fuel products farmers rely upon like fuel, pesticides, propane, fertilizers, so it's not surprising that they often resist change. "Understanding rural communities' concerns and interests around climate change and climate policy is the essential starting point," he writes. "In general, their views are based upon their economic and social realities, which differ in some key ways from their urban counterparts, particularly around the issues of wages and energy costs." Kleinschmit also places the blame for rural resistance to new energy policies on "climate change deniers" and an emphasis on financial hardship that new regulations and taxes would have on rural communities. He says that there is a need for an emphasis on "opportunities" instead. Kleinschmit thinks rural resistance is not inevitable, but change must take place in more ways that benefit rural communities. He says rural communities haven't gotten their share of the jobs promised by green energy, even of green industries that take place in rural communities like wind or solar,which have largely gone to large corporations and "bypassed the local communities where these facilities are located." Some postal employees are displeased with Postmaster General Pat Donahoe's Wednesday remarks to Congress about the U.S. Postal Service's move to end Saturday delivery of first-class mail, an attempt to stanch its multi-billion-dollar deficits. National Association of Letter Carriers President Fredric Rolando wrote in Postal News that Donahoe didn't have a firm grasp on how the reduced delivery schedule would affect mail volume, a crucial component of the move's financial impact. He said Donahoe's $2 billion estimate of savings "lacks credibility because his previous estimates have been found to be wildly inflated by, among others, the Postal Regulatory Commission — in part because they don’t reflect the lost mail volume that would result." Beginning this year, participants are required to set up a personal account, even if they have participated before. For a PDF of the instructions, click here. Rural health care providers could especially feel the sting of "the sequester," or automatic federal spending cuts due to hit March 1. According to a study by iVantage Health Analytics, impending cuts could mean closure of rural hospitals and loss of rural health care jobs. The sequestration is expected to involve a 2 percent reduction in Medicare reimbursement that iVantage predicts will make 63 rural hospitals unprofitable and mean the loss of 482 rural health care jobs nationally, George Lauer reported for California Healthline. "This is going to have an impact everywhere -- urban, suburban, rural -- but I think it's fair to say rural will feel it more, especially small, remote, providers," Gregory Wolf, iVantage vice president, said. Lauer pointed out for his California readers that the state would not be as "hard-hit" as the Midwest and South. iVantage presented its research at the yearly Rural Health Policy Institute of the National Rural Health Association this month. Its summary read, "Rural hospitals face major financial challenges given their relatively small operating scale and workforce shortages. Under a proposed 2% Medicare reimbursement reduction resulting from sequestration, these challenges will be exacerbated." Many hydraulic fracturing companies in Texas have not revealed the make-up of the chemicals they use to blast into the earth and release hydrocarbons. Texas was the first state to require frackers to disclose their chemicals, but it allows companies to exempt "company secrets" and that's "a loophole big enough you can drive a frack truck through," Luke Metzger, the director of Environment Texas, told Jennifer Hiller reports for the San Antonio Express-News. Fracking companies argue that they deserve the right to protect chemical mixtures they spent lots of money perfecting, while environmentalists say citizens deserve to know what is being used. "Of 12,410 instances of hydraulic fracturing in Texas between April 2011 and early December 2012, companies used terms such as 'proprietary,' 'secret' or 'confidential' 10,120 times while reporting data on the FracFocus.org website," Hiller reports, summarizing data collected by the Pivot Upstsream Group. FracFocus is a website where companies can "voluntarily report the composition of hydraulic fracturing fluids," Hiller said. Hiller used the example of Eagle Ford Shale, a South Texas field that used the trade exemption in 2,297 of its 3,100 fracturing events. Some local residents are concerned that the exemption is letting companies get by with using chemicals they shouldn't. "I've heard they've used everything from formaldehyde to instant coffee. Who knows? Nobody knows for sure," Bill Sibley, a Texas rancher, told Hiller. Sibley told Hiller he was happy to have the oil and gas activity on his land, but was worried about chemicals contaminating his water. Landowners and those who live next to lands where fracturing, as well as state regulators, are allowed to challenge trade secret exemptions, Hiller said. According to FracFocus, many companies use hydrochloric acid, petroleum distillates and ethanol. Industry personnel say the details of the chemicals used are kept secret because of competition. "You can say 99 percent of the fluid is the same," David Blackmon, a managing director of FTI Consulting and a spokesperson for Energy in Depth, an industry website, told Hiller. "When it comes to the content of chemicals there's a great deal of competition." The 99 percent of the fluid that all companies share is water, Blackmon said, meaning that the undisclosed 1 percent is chemical. "They've made incredible progress in developing fluids that reduce the overall water use, that allow us to use an ever increasing percentage of briny water rather than fresh water, and to reduce the number of chemicals used in frack jobs, and to use common everyday stuff that you use in your kitchen or bathroom to replace more potent chemicals," Blackmon said. Lance Robertson, vice president of Eagle ford production operations for Marathon Oil Corp., echoed Blackmon's sentiment at a recent forum, saying "There are more dangerous things under my sink than we pump." South Dakota seems to have enough lawyers; they just aren't practicing in the right places. That's the thinking behind recent legislation that would offer financial incentives for lawyers to practice in rural counties that currently rely on out-of-town lawyers. South Dakota's rural lawyer shortage reflects some of the wider problems of rural depopulation and the increasing urban concentration of professionals. Senate Bill 218 aims to start a four-year pilot program that would reimburse tuition for law students who work in rural South Dakota areas for five years after graduation, or would financially reward attorneys who move to rural areas, Andrea Cook reports for the Rapid City Journal. The state and beneficiary counties would share the cost, with counties paying 35 percent, Cook said. "We have enough attorneys in this state, but they're all condensed into basically four counties," South Dakota Supreme Court Justice David Gilbertson, a supporter of the bill, told Cook. She reported that 65 percent of the lawyers in South Dakota live in the state capital of Pierre, Rapid City, Aberdeen or Sioux Falls. On the other end of the scale, the Sixth Judicial Circuit in the middle of the state has keenly felt the lawyer shortage, with about half of its 14 counties in the circuit having fewer than four lawyers, Cook reports. "When someone facing criminal charges qualifies for court-appointed representation, judges often have to look far away to make defense attorney appointments," Cook said, explaining that the bill for each out-of-town court appointed lawyer translates to $1 per mile traveled and $88 per hour with clients. In addition to the expense, he siad, relying on distant lawyers also means long court days and difficulties in scheduling. "It's really tough where you have an abuse and neglect case where you got maybe one mom and a couple dads and you need an attorney for the kids," Fourth Judicial Circuit Judge Warren Johnson, told Cook. The cell-phone boom has led many states to deregulate land-line phone providers, allowing them to drop the service, and similar legislation is pending in several states. Rural communities with poor cell reception could suffer price increases from the resulting lack of competition, as phone companies in deregulated states are no longer legally required to provide land-line service to all citizens. Twenty states that have deregulated land-line service. Sherry Lichtenberg, telecommunications research and policy principal at the National Regulatory Research Institute, told The Rural Blog that deregulation legislation is also pending in eight states: Nevada, Kansas, Iowa, Mississippi, Indiana, Kentucky, New York and Rhode Island. She said a bill further deregulating telecommunications in Ohio failed last session, and bills in New Jersey and Connecticut were withdrawn. Many of those resisting the change have expressed concern for rural customers; this trend held true in the most recent state to move forward with deregulation. On Monday, Kentucky's deregulation bill passed a committee in the Republican-controlled Senate, and is being supported with a radio advertising campaign, but "The bill faces an uphill battle in the Democratic-controlled House," reports Jack Brammer of the Lexington Herald-Leader. "The primary concern voiced by opponents Monday was that the changes would leave rural Kentuckians, particularly seniors, without reliable phone service," Don Weber reported for cable-TV news service cn|2. Opponents said cell coverage in rural areas can be unreliable, and that the 80 percent of seniors who still use a land-line could be adversely affected. The bill's sponsor, Sen. Paul Hornback, R-Shelbyville, said his rural constituents' main telecommunications concern is lack of high-speed Internet service, and deregulation would allow telecom companies to invest more in broadband. He said the bill would ban ending landline service in rural areas with fewer than 5,000 landlines unless another company can offer a similar service. Brammer reports, "Tom FitzGerald, director of the Kentucky Resources Council, said the bill would allow carriers to stop serving areas where wireless services are available, which is not the same as a land line. 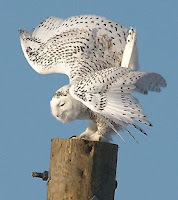 Many parts of rural Kentucky have wireless service that is unreliable, he said." 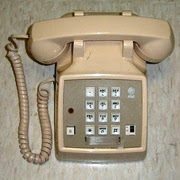 FitzGerald told the committee, "Even AT&T's own website says that it is not comparable to a land-line service." In an op-ed piece for The Courier-Journal he gave more details about the legalities of the measure. Record low water levels in the Great Lakes are hurting the economies of some harbor towns. Tourist, shipping and fishing industries in the region could suffer as a result. In the Grand Traverse Bay area, the small towns of Suttons Bay and Leland are two examples of the growing problem. Elizabeth Brackett of WTTW in Chicago reported for PBS NewsHour that a drop of more than two feet from the average level is "threatening to close the harbor" in Leland, a town that relies heavily on a good tourist summer season to get it through the rest of the year. In Suttons Bay, concrete blocks designed to anchor boats "now sit in just inches of water," Brackett reported, walking along a beach that didn't used to exist. In an interview with Brackett, Andrew Gronewold of the Great Lakes Environmental Research Laboratory cited high water temperatures and increased evaporation for the low water levels. "Now, what is causing the lakes to warm so much? That is something that is going to require some additional research," Gronewold said. Dredging can keep harbors open, but suffering economies aren't able to keep up with the demand for such maintenance. "You got almost a perfect storm hitting the Great Lakes harbors," Chuck May, chair of the Great Lakes Small Harbors Coalition, told Brackett. "You've got low water and you've got lack of maintenance, lack of dredging, lack of infrastructure." The shrinking water levels are also hurting commercial harbors, where low levels affect how much tonnage ships can ship. "For every inch the water level drops, carriers forfeit 8,000 tons of cargo," Brackett reported. This problem is exacerbated by the fact that the Obama administration has new regulations that mandate that commercial harbors have to be able to handle a million tons to get federal money for dredging. Of the 139 commercial and recreational harbors on the Great Lakes, only 15 now meet this criteria, Brackett reported. Some area residents say the harbor taxes they pay should go to dredging. "The federal government actually owns these harbors, these channels," May said. "And they actually have a tax called a harbor maintenance tax that they put in place the beginning of 1985 to take care of these harbors. So far, in the past 15 years, they have collected $8 billion dollars that they have not spent on harbors." A book about the top 100 most-watched American telecasts has prompted a survey about rurality on TV. The Agricultural Communications Documentation Center on the main campus of the University of Illinois wants to know how many TV broadcasts featuring rural settings, people, or activities people expect to see on the Top 100 list. The survey was prompted by television historian Wesley Hyatt's 2011 book Television's Top 100: The Most-Watched American Broadcasts, 1960-2010. Hyatt's book outlines the date, rating, share, competition, cast and synopsis of 100 top broadcasts that range from sporting events to movies -- and some have rural themes. 1. What share (percent) of those most-watched broadcasts would you expect to feature rural settings, people, or activities? 2. What specific television programs with rural flavor would you expect to find in that Top 100 list? Answers go to docctr@library.illinois.edu. Results and winners will be announced in the next issue monthly issue of ACDC News. After hearing endorsements from former CIA director James Woolsey and a bipartisan slice of Kentucky's congressional delegation, a state Senate committee today approved without dissent a bill to allow and regulate commercial hemp crops if the federal government gives the state a waiver from marijuana laws. 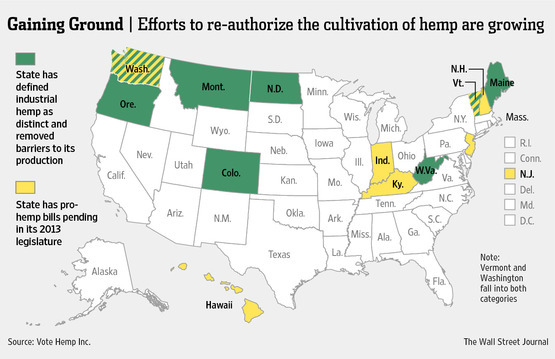 The Kentucky bill's advocates hope to make the state a test bed for the return to the U.S. of commercial hemp, which Woolsey said is legal in 35 industrialized Western nations, including Canada. "We cannot find one that has had a problem distinguishing industrial hemp from marijuana," Woolsey told the Senate Agriculture Committee. He said he is a member of the North American Industrial Hemp Council "basically because of my interest in prosperity for rural America." 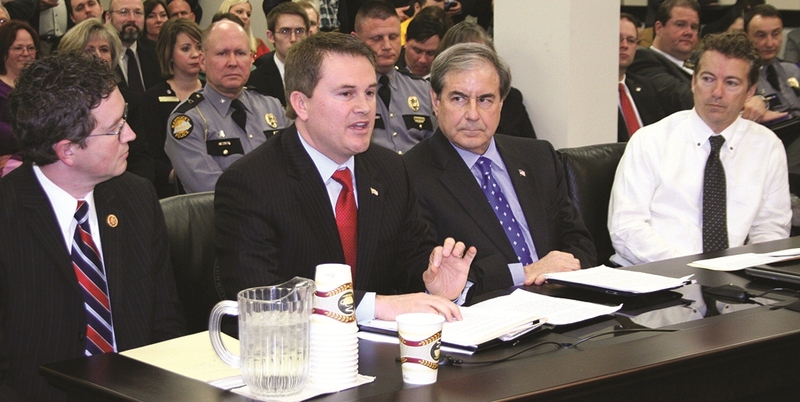 The bill, pushed by Republican state Agriculture Commissioner James Comer, still faces obstacles, especially in the Democratic-controlled House, and the Drug Enforcement Administration has refused to give waivers for hemp production. However, "The government interest in worrying about marijuana issues is subsiding some," said U.S. Rep. John Yarmuth, D-Louisville, who will ask the Obama administration for a waiver. Alluding to recent pro-marijuana legislation in some states, Yarmuth said at a press conference, "The overall climate of the country will make it much more easy for DEA to relax its policy on granting waivers." Joining Yarmuth in endorsing Senate Bill 50 were Republican U.S. Sen Rand Paul, wearing a hemp shirt, and Rep. Thomas Massie of the Fourth District. They have each filed bills, with Oregon co-sponsors, to exclude from federal marijuana law any part of the hemp plant with 0.3 percent or less tetrahydrocannabinol (THC), the plant's psychoactive ingredient. For the House bill, click here. State Police Commissioner Rodney Brewer (in first row of audience in photo) continued his firm opposition to SB 50, saying his main concern was that marijuana could be hidden in hemp crops. Woolsey said pot growers would "have to be stupid or very high to take that route," because they could not prevent male plants from pollinating females, which stop producing THC-rich flower buds when pollinated. "The marijuana growers are about the last people who want industrial hemp," he said, because the fine pollen can travel far and even fertilize indoor crops. He also said hemp is harvested before marijuana. Senate Majority Floor Leader Damon Thayer said Woolsey brought "a great deal of credibility" to the hearing because he had been "at the apex of deciding what is good and bad information" at the CIA. Brewer also said parts of the hemp plant left not used in processing could be processed into a THC-rich oil, and Kentucky hemp could be used to cut high-THC marijuana from the West Coast. He said the state needs a pilot project to get beyond anecdotal evidence, not immediate commercialization. House Speaker Greg Stumbo has called for a study. Committee Chairman Paul Hornback, R-Shelbyville, the bill's sponsor, said that would be a waste of money. At least two senators who were not expected to vote for the bill did so: newly elected Republicans Sara Beth Gregory of Monticello and Whitney Westerfield of Hopkinsville. "We have the potential to create jobs in rural Kentucky, especially," Gregory said in explaining her vote. Westerfield, a former prosecutor who unseated a leading hemp supporter in the November election, said he "went all last year" thinking there was no difference in hemp and marijuana, then received conflicting information on both sides. He said he is still not certain, but thinks the state should try to take advantage of the opportunity "as long as we proceed with caution." At a Capitol rotunda rally of hemp supporters after the meeting, Garrard County Attorney Mark Metcalf said he supports the bill because "It will bring industry that adds value to the crop." State Rep. David Monson of North Dakota, a leading hemp advocate, told the committee that hemp is so bulky that its transportation costs are high, requiring processing plants to be relatively close to the fields. He and Gail Glenn, a farmer, said hemp is also a good rotation crop that fights pests and requires no herbicides or pesticides. The case of an Indiana farmer who planted the genetically altered soybeans he got from a local grain elevator has reached the U.S. Supreme Court. Hugh Bowman's dispute with agricultural giant Monsanto has evolved into a larger debate of the influence big agribusinesses have on farmers. Monsanto, the producer of the powerful herbicide Roundup and the genetically altered crops that resist the herbicide, says that Bowman's decision to plant the seeds he got from the grain elevator, seeds that farmers are expected to use for feed, was a violation of their planting agreement with farmers. "His legal battle, now at the Supreme Court, raises questions about whether the right to patent living things extends to their progeny, and how companies that engage in cutting-edge research can recoup their investments," Robert Barnes reports for The Washington Post. More than 90 percent of U.S. farmers use genetically altered soybean seeds from Monsanto or from companies licensed by Monsanto, Barnes writes. The beans farmers grow from these seeds have the same Roundup Ready traits that the original seeds did, but Monsanto has farmers sign an agreement that they will not use the beans for a second planting. Farmers also aren't allowed to sell the beans to others for planting, but they can sell them for feed to grain elevators like the one where Bowman got the beans in question, Barnes said. Bowman, now 75, bought Roundup Ready seeds from 1999 to 2007 for initial plantings, but used seeds from the local grain elevator for second plantings, which are usually less profitable, making Monsanto's seeds less economical. Monsanto sued Bowman and was awarded nearly $85,000, Barnes said. “Monsanto should not be able, just because they’ve got millions and millions of dollars to spend on legal fees, to try to terrify farmers into making them obey their agreements by massive force and threats,” Bowman told Barnes. Monsanto has countered that its "notoriously high research and development costs" to produce living products like the Roundup Ready seeds merit legal protection for its seeds and their progeny. "Inventors are unlikely to make such investments if they cannot prevent purchasers of living organisms containing their invention from using them to produce unlimited copies," Monsanto said in its court brief. Monsanto has raised fears about what the end of a streak of legal victories for the company might do to the biotechnology industry, and many experts have argued in its favor, Barnes reported. Patents and patent protections lie at the heart of innovations like the ones that made Roundup Ready seeds available for farmers, some say. Over a week after the Super Bowl, people are still talking about one commercial. A Dodge two-minute ad featuring images of American farmers, set to the late Paul Harvey's "God Made a Farmer" speech, aired during the event that doubles as the Olympics of American advertising. USA Today's final rankings of Super Bowl ads had the commercial finishing third, but reaction to it has ranged from warm praise to harrumphing derision, reflecting debate about modern American agriculture. Radio commentator Harvey made the speech in 1978 to the Future Farmers of America convention. "The job description he laid out should have been enough to send them all running: Hundred-hour workweeks; make-do lifestyle; the kind of humble, hardscrabble simplicity that sounds a lot more noble in novels and speeches than it feels in real life," wrote Jennifer Hemmingsen, a columnist for The Gazette in Cedar Rapids, Iowa, who was 5 years old in 1978. Hemmingsen recalled how Harvey's words described the farming world her grandparents held dear and was an important part of her childhood, even as it was slipping away with small farms being replaced by larger ones. "We Iowans all have our own versions of this story, " she wrote. "Still we thrilled to the still photos of Dodge's Super Bowl ad last week; felt our hearts hum to the purposeful tune of Harvey's words. We couldn't help it. It spoke to deep-held beliefs about who we are." Despite her approval of the ad, Henningsen noted, "Today's small farmers need more than sainthood -- they need a chance at preserving their livelihood. A chance at passing on more than a set of romantic notions for future generations." Longtime "Food and Farm" columnist Alan Guebert had a much less favorable reaction in his new "View from the Levee" column in the online Daily Yonder. "Yes, it was a heaping helping of raw American myth, but myth sells," Guebert summarized. He said a Progressive Farmer online article on Super Bowl Sunday, describing a 50-square-mile family farming operation in Kansas, was a much more accurate depiction of modern American farming than the small-farm lifestyle lauded in the ad. 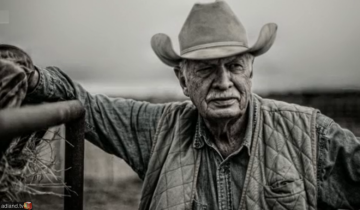 Guebert also questioned Harvey's suitability as the voice of the American farmer, noting that Harvey was a supporter of People for the Ethical Treatment of Animals and "No real cowboy, pick-up truck or not, can stand PETA." Approaching spending cuts may shut down the meat industry for two weeks. The cuts, collectively called "the sequester," would take place March 1 unless Congress heads them off. Two-week furloughs for U.S. meat and poultry inspectors are slated to be a part of the cuts. Since federal law prohibits shipping meat without a U.S. Department of Agriculture seal of approval, the furloughs would effectively shut down the industry for two weeks, Charles Abbott reported for Reuters. Janet Hook of The Wall Street Journal predicted the sequester will come: "Despite warnings about the threat to military readiness, education programs and activities across the government, both parties say that it is likely the deadline will pass without a compromise being reached and that the spending cuts will take affect at least temporarily." One USDA official estimated the resulting production losses for the industry at $10 billion, Abbot reported. Employee pay for 8,400 inspectors accounts for most of the $1 billion USDA spends on meat safety yearly. The American Meat Institute said USDA should keep inspectors working so plants can stay open and furlough other employees, as well as cut non-vital programs rather than "inflicting unnecessary hardship" on the industry, Abbott reports. Others said there isn't much choice but to go forward with the furloughs: "There's not much we can do when Congress says to cut every line item by a certain percent," Agriculture Secretary Tom Vilsack said in a speech. Legislation introduced by House Democrats would avoid the cuts by eliminating tax breaks, cutting farm subsidies and and taxing millionaires; House Republicans want to replace defense cuts with "deeper" cuts to domestic programs, Hook writes. Tobacco farming has changed considerably since federal quotas and price supports ended in 2004, but for the relative few who still raise the crop, the job remains much like it has been for a century or more -- especially in the Black Patch of southwestern Kentucky and northwestern Tennessee, where generations of families have raised dark fired tobacco, used mainly in snuff and chewing tobacco. "Sharing the complexities of the craft with those who are unfamiliar is not an easy task," but a documentary premiering Monday night on Kentucky Educational Television "intends to do just that," Bobbie Bryant writes for The Courier-Journal of Louisville. The film, "Farming in the Black Patch," follows members of her family. It airs at 9 p.m. EST and will be available on www.ket.org.